I don’t know if I can possibly write the words that express my emotion about this picnic gingham blanket. When I started on this crochet journey in hopes to become a grandma almost three years ago, I really had no idea that it would take me to having one of these much prayed over, hoped for blankets, shared with the whole wide world through Yarnspirations.com. I’m incredibly humbled by it all. It all started with a single sentence. “Crochet it and they will come.” That’s the sentence I saw in my head that I acted upon. I told it to my oldest daughter Hannah, not to stress her out because she’d just started investigating why for the last five years she wasn’t getting pregnant, but to let her know we’d plan on it and eventually a baby would come. It was meant as an expression of hope. And back then, I’d only been a casual crocheter. I’d made one chevron blanket for my daughter Haley and dabbled a bit with tunisian crochet making a few scarves for friends. I’d been taught how as a young girl by my mother, who had been taught by her grandmother but never explored much beyond knowing the basics. 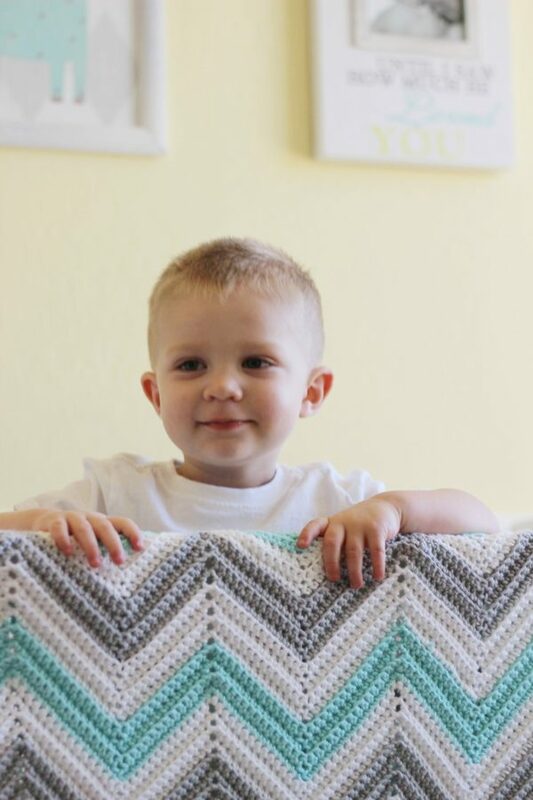 Through the years, my mom crocheted blessing blankets for each one of my children, so maybe unconsciously that’s what I thought one did to prepare to welcome a grandchild into the world–make a handmade item. And since I came from a line of women who crocheted, that’s what I did. Then one day I ran into my friend Andrea while out shopping. She had been trying for ten years to have a baby, and she knew what Hannah had been going through. I told her my grand idea, that if “I crochet it, they would come.” She said it wouldn’t hurt to try and we laughed at my silly idea. But as I was walking away from her, I felt like the blanket I was making might not be for Hannah. Flash forward three or four months, and I ran into Andrea again. She had tears in her eyes the minute she saw me. She had just come from the doctor, she wasn’t announcing to the world just yet, but let me in on the secret. After ten very, long years, she was pregnant! That blanket was for her and I was very excited to give it to her. Now I thought my idea just might work. So I kept crocheting and sharing the blankets on Instagram. I was very open with what I was making, detailing every stitch I’d learned. I gathered old stitch books I had, ordered more and got to work experimenting with different types of yarn. 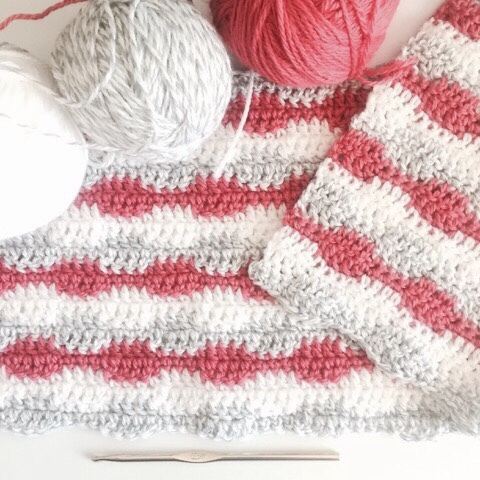 Then it happened again, a friend of Hannah’s who had been trying for about three years, became pregnant, and the coral and grey interlocking blanket was given to her. Several more babies were given blankets. These were babies that were so longed hoped for. And then, of course, the miracle of Iris happened and you can read about it here. And gingham became a real part of the story. I’d been wanting to come up with a way to make gingham that didn’t involve granny squares. I first made a pink one, and then this beautiful purple for Iris. All through this though, I was learning about the online crochet world. I became familiar with the yarn companies that were making the yarn I was using. Most of the time, I was using Caron Simply Soft. At the time I had no idea that the same company that made Caron, also made Bernat and Patons. Those were some of my favorites. I made the grey gingham with Paton’s beehive baby sport. At some point, the team behind Yarnspirations.com reached out to me. They loved the blankets I was making using their yarn! I was so surprised. Of course, I wanted to work with them and design even more blankets with their yarn. 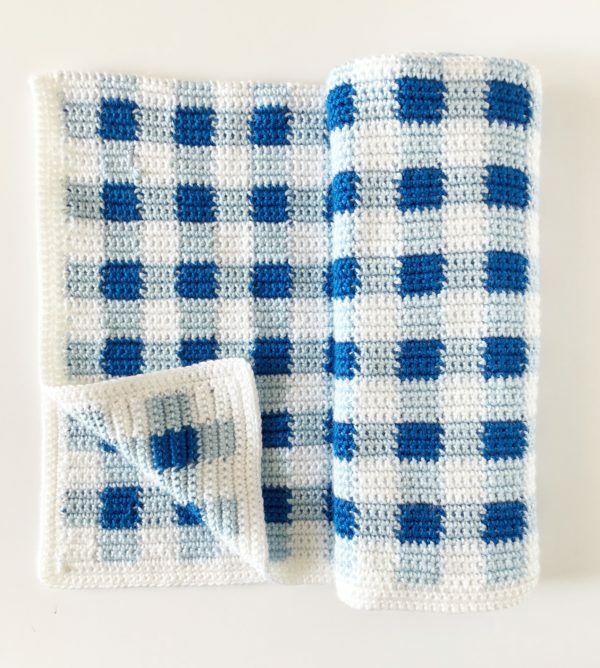 And now here we are with the worldwide launch of the picnic gingham blanket in blue! I really thought this one might be the one. I mean what a great ending to a story! The one blanket I finally make, that is released to a large crochet audience, I just thought for sure that Hannah would be calling me as I finished that last stitch. I finished this blanket back in April and a lot happens behind the scenes before a blanket is published. It needed to be photographed professionally. And the pattern had to be written professionally! So there is no announcement, I’m not becoming a grandma just yet. However, my faith has never been stronger. Thank you all for making and sharing a Daisy Farm blanket with me. I am so happy that they are being made for others. And I’ve said this before, and I’m sorry to repeat it, but every blanket made feels like an extra prayer sent heavenward. SC in the second chain from the hook and the next 4 chains, pulling through with soft blue just as you are about to finish the stitch. 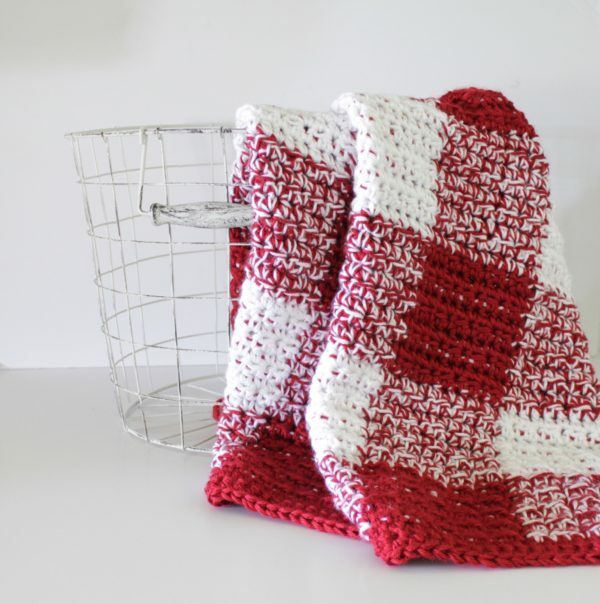 Also, if you have never made a gingham blanket before please read this post about how to make a gingham blanket. You will be switching between white and soft blue every 5 stitches to the end of the row. Ch 1 and turn, bring the white around the end and continue with SC. Repeat this block of colors for 5 rows. After 5 rows, cut the white off, (the soft blue will be used throughout the entire blanket), and add in the royal blue. Now alternate your SC stitches with 5 each of Royal Blue and Soft blue. Continue repeating this pattern for 125 rows. When you are finished, weave in all the ends first before you start the border.